Developing healthy habits during your weight loss program can put you on the track to long term weight loss success. Getting fat burning injections and visiting with your medical weight loss doctor for nutritional counseling and other forms of weight loss support will help you keep up with your weight loss goals as you continue on your path towards wellness, but what happens next? At some point the active phase of your weight loss program is going to come to an end, but your efforts to maintain your weight loss will never stop. While you can always turn to your weight loss doctor for support with fat burning injections, it will benefit you to take the time early on in your weight loss program to begin developing healthier habits that will last you for years to come. One of the healthiest habits you can start is cooking healthy meals night after night. If you’ve never been much of a cook before there is nothing to fret about. Cooking is simple. All you need are the right tools, a good recipe, some healthy ingredients and a few simple techniques and you are ready to start preparing food tonight. Get the tools: All you need to get started are a few basic utensils. This would include a wooden spoon, a good knife and cutting board, a frying pan, a pot to boil or steam vegetables and a casserole dish so you can bake something. Get the ingredients: Before you head to the store have a long talk with your weight loss doctor and assemble a list of quality ingredients. These may include items like vegetables, brown rice, whole wheat pasta and lean protein sources like poultry, fish and beans. You will also want to purchase a few good calories for some zero-calorie flavor, as well as cooking oils. Rosemary, paprika, salt, pepper and garlic are great spices to start with, and olive oil has a lot of healthy benefits for cooking with. Get a recipe: Have a look online to find a recipe that sounds good to you. Find one that uses healthy cooking methods like baking, grilling or pan searing and not any sort of frying. You can also ask your weight loss doctor, Dr. Holloway, if he knows of any healthy recipes you should try. 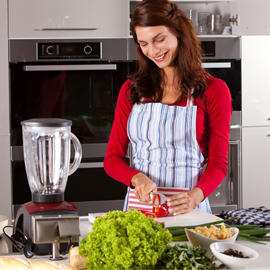 Get started: Remember safety first when you are in the kitchen. Always pay attention to what you have on the stove and don’t leave anything unattended. When cooking with oils only use a small amount to coat the pan so you do not accidently fry your food, and never heat oil at anything over a medium heat or you will smoke out your kitchen. Before eating any meat use a thermometer to ensure it is over 160 degrees Fahrenheit in the center. Do you have any other tips for the beginning cook? If so please share your thoughts and experience in a comment below!